Over in the Philippines, Nickelodeon has brought Spongebob Squarepants and his friends to life with the Summer at the North event. The world of Bikini Bottom has taken over SM City North EDSA – Southeast Asia’s largest mall – and BAIT took part in the event’s kickoff this past Saturday! 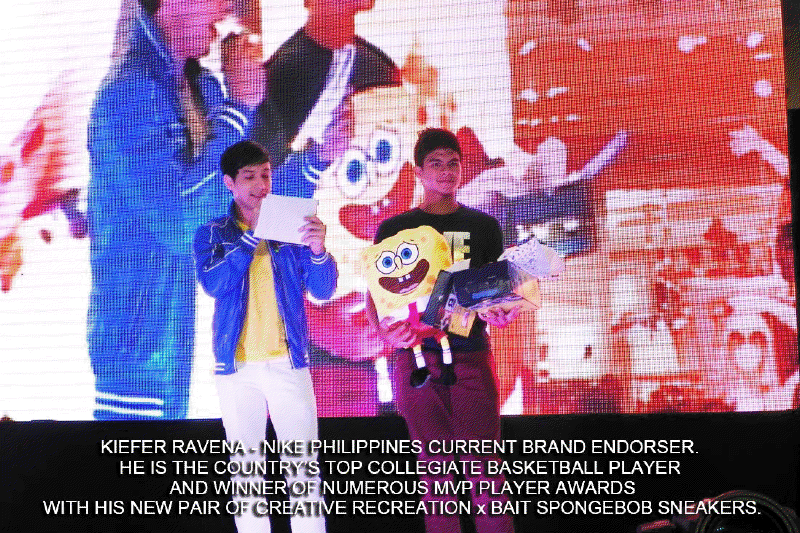 Two local talents and Spongebob fans – Kiefer Ravena (the Philippine’s top collegiate basketball player and local Nike endorser) and Arjo Atayde (winner of Best New TV Personality at the Philippines Star Awards) – hit the stage to launch the event. Both were showered with some fresh new Spongebob gear, including sneakers from the BAIT x Creative Recreation x Spongebob Footwear Collection. The two stars are pictured above receiving their new kicks! The event lasts until May 31 and will feature character appearances, famous locales from the show, and special limited-edition products from BAIT x MINDstyle – leading into the POP Life! Exhibition this fall.